1998 is when this amazing movie came out that just completely changed my newly eleven-year-old life. It touched me in a way that no movie had ever done before and really hasn't since. Sure, I've got my favorite movies--Gone With the Wind, Roman Holiday, The Seven Year Itch, and some others that all fill me with a sense of wonder--but this one is special. It combines some important elements of my life--books, meeting people online, having to be braver than I believe I am--and helps me know that I'm not alone...which is always important, especially when you are eleven years old. More than any of the other quotes I am going to share with you, this one means the most to me. 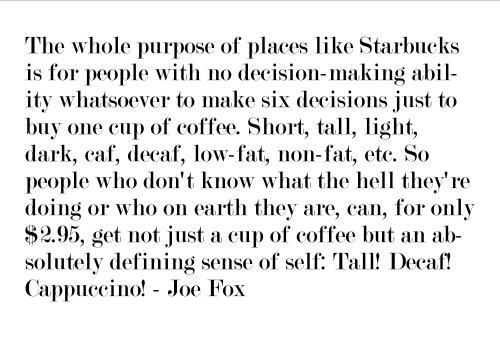 I think I could write an entire blog post dedicated to my feelings on this quote and how much it applies to me. Obviously, I don't see anything wrong with reading...but sometimes I worry that I miss out on some of the other things in life or that I spend too much time in books--even if it's just thinking so much about a book after I finish and walk away--and not enough time doing original things. OK. I've never been to New York, let alone New York in the fall, but this really sums up that feeling you get on the first day of school or when fall truly begins wherever you live (which happens to be late September, early October in Oklahoma). My program is almost entirely online and yet I can't help the thrill of buying new school supplies every year before school starts. The leaves are turning and then dying, and the world is preparing for its long slumber through winter, but there is a sense of hopeful anticipation. Or I am just crazy. Whatever. I mean, forget about the acting--which is amazing--there are some of the most amazing quotes and truths about life and books and happiness in this movie. It's about living a simple life and finding pleasure in the small things. I just want to crawl inside the movie and live. What about you? What movies have changed your life so much? What movies make you want to crawl inside them and live? I. Love. This. Movie. Seriously, it is one of my all-time favorites and makes me want to own a bookstore! I absolutely love that first quote. I wonder the same thing about my life too. I completely adore this movie!!! 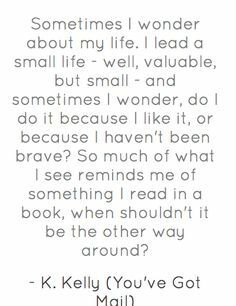 As a lover of reading and writing, it combined so much of what I love within this world. And Ms. Kelly's feelings about books for the young mirrored mine exactly. Such a great movie!!! I'm SO watching this tonight because Will is going to a soccer game. Too bad you live so far away or we could watch and drink some wine! I love this movie, too! It's kind of a guilty pleasure, because the whole thing with him running her out of business and then hiding who he is for the last half of the movie skeeves me out a little. BUT it's adorable and I love the way NYC looks and BOOKS! And! Just! I love it. This is one my all time FAVORITE movies! I really love that first quote, too, and I understand what you mean. BEST. MOVIE. EVER. This is my go-to rainy day, sad day, confusing day, defeated day movie. Whenever my heart is heavy or I'm feeling contemplative, there is no substitute for You've Got Mail. "He could be the zipper man!" "Who's that?" "He repairs zippers on Amsterdam Avenue!" OMG, I am in love with this post. This is one of my favorite movies of all time because of some of those quotes you mentioned, the soundtrack, the premise, acting, etc. I'm going to add those quotes to my Goodreads right. now. I remember finding this movie among my mom's collection of video-tapes, and randomly putting it into our VCR. I fell in love instantly, and for two entire weeks I would watch it every day I got home for school. It is filled with so many lovely quotes and profound life philosophies; and it's about books, love and joy. One of my absolute favorite movies of all time. I love this post--brings back memories of that movie! Haven't seen it in ages! I used to watch every Meg Ryan film out there--shame she doesn't act anymore. (My other fave Meg Ryan, tied with this one, is Sleepless in Seattle). I always wanted to be a small bookstore owner when I was a teen/young adult. I actually worked for Books A Million for a couple years as an adult--believe me, it is not the same. I grew up in NY (not Manhattan though) and it brings up memories of back to school shopping in the crisp air, with leaves swirling outside. Well, enough of me, thanks for reminding me to watch this again, and I appreciate your pick of quotes. This is my favourite rom com of all time. And it's up there in my top 10 favourite films of any genre. 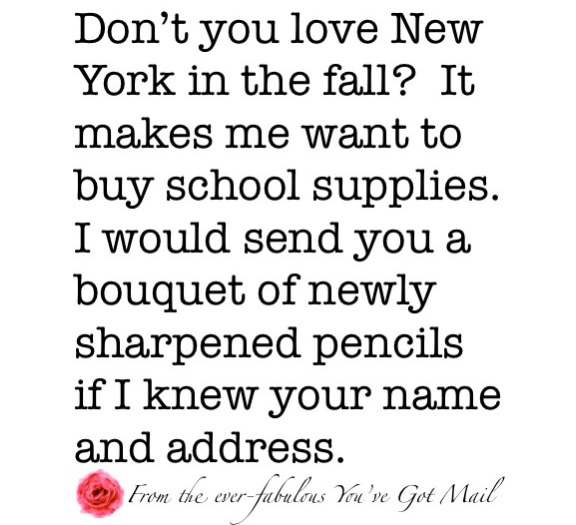 I love that quote about the bouquet of sharpened pencils - which is exactly how I feel in the autumn when it comes to school supplies... I'm just not in New York. And I always get teary eyed watching the end of this film - it's just so lovely. 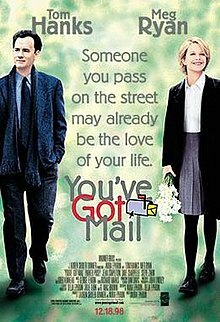 I've loved Meg Ryan ever since I saw When Harry Met Sally for the first time and You've Got Mail ranks up there as one of my favorite movies. I love school supplies - there's nothing better than wandering through the aisles at Target looking at binders and pens and paper and folders. I'm going back to school in January and I'm really excited about buying school supplies for my classes. I totally agree with everything you've said! Well.. except for the real life thing. Sometimes I let stupid rl-things get in the way of reading books and I regret that. Life would be much easier if I just took more time to sit down, relax and read a book. I was 10 when this movie came out and I believe it changed the course of my life. I LOVE everything about it, to this day, and will stop whatever I'm doing if it's on TV. It's also a great pick me up for a bad day. I have never read Pride and Prejudice but I think the parallel between Elizabet/Darcy and Kathleen/Joe is really interesting. I never thought about it that way before. I actually really didn't like this movie much when I first saw it (and it was only the one time that I've seen it.) I just hate how they dislike each other so intensely in real life before softening (I don't really like the other film versions either.) But I do adore those quotes so I'm wondering if I should give it another watch as a more mature individual. I love this movie as well! It's such a great movie to curl up on the couch with a blanket to watch, especially as the weather changes (or if you're home sick)! I think the credits note that it is based on a story called "The Shop Around the Corner" which I always mean to look up whenever I watch the movie and then promptly forget. Have you heard of/read it?